This module provides insight into how nearshore circulation and wave dynamics are involved in rip current formation. Topics covered in this module include: nearshore terminology, circulation and waves, rip current characteristics, and rip current forcing mechanisms. 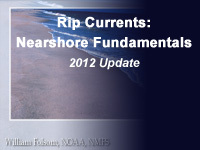 This module is the second of three modules covering the forecasting of rip currents. I really enjoyed this lesson and would encourage others to take it. The course material did not help prepare me for the poorly worded test questions. Module needs more detail on how to identify and predict the occurrence of rip currents. It would also be useful to have more safety information related to rip currents. • Describe the various zones, bathymetry features, and currents of the near shore environment. • Describe shallow water, near shore process. • Describe rip current characteristics. • Describe rip current forcing mechanisms. February, 2012: This module has been updated to provide greater flexibility in navigation and linking to specific content. In addition, minor changes have been made to improve the clarity of the content and correct inconsistencies. However, these changes do not affect the overall substance of the material taught.